You know how sometimes you get a little bored with sewing and you want a fresh challenge? Bra-making, people. It’s a whole new ball game of duoplex, simplex, powernet and rigid lace. Those of you who have made bras already know what all that means. I’m a total bra-making noob and knew nothing. Absolutely nothing. Introducing, the Balconette Bra with pattern and fabric both from Booby Traps. Feeling ready for sewing challenge and with a birthday pending, I put in my request for a bra-making kit from mum. She thought I was crazy. Like it was the weirdest birthday request she’s ever had. And admittedly, it probably tops the list! Anyway, not caring about that, I went on a pattern hunt. For me, it HAD to have underwire and it couldn’t look like something my grandma would wear. The winner was Booby Traps. The big clincher, aside from modern designs, was that they sold both the patterns and kits. Because I had no idea what each pattern needed in terms of fabrics and their quantities, kits were the only way to go. Okay, so Booby Traps. They’re a small Australian business and not really set up for international orders. It’s possible, but it’ll take some postal code rejigging, a few (friendly) emails and two separate PayPal payments. They were great to deal with, but it’s not like your usual online shopping. So please be patient with them because they are lovely people. When the kits I wanted weren’t listed, they also happily made them to order. Because they know the patterns, they knew exactly what fabrics (stretch or rigid) that I needed and could steer the purchase accordingly. That was invaluable. I was adrift in the sea of lace. Would I use them again? Maybe. With Booby Traps, you have to place an order over $100 and now that I know what I need, I’ll likely try source fabric closer to home. But I do like their patterns and it’s more my style than other offerings I’ve seen, so I wouldn’t mind more of their patterns one day (PDF, to avoid the shipping and emailing). I actually made their Plunge Bra first. It was all wrong on me. The problem was that it’s a foam based bra and I only had enough foam for one bra. Not enough for a muslin (ALWAYS muslin a new bra pattern!). So, I’m treating that first version as my test and I’ll work on sourcing more foam for another attempt. The pattern has potential to be a winner and could easily become a favourite when I make a tweak or two, so I haven’t given up on it. I was feeling very lost at this point. 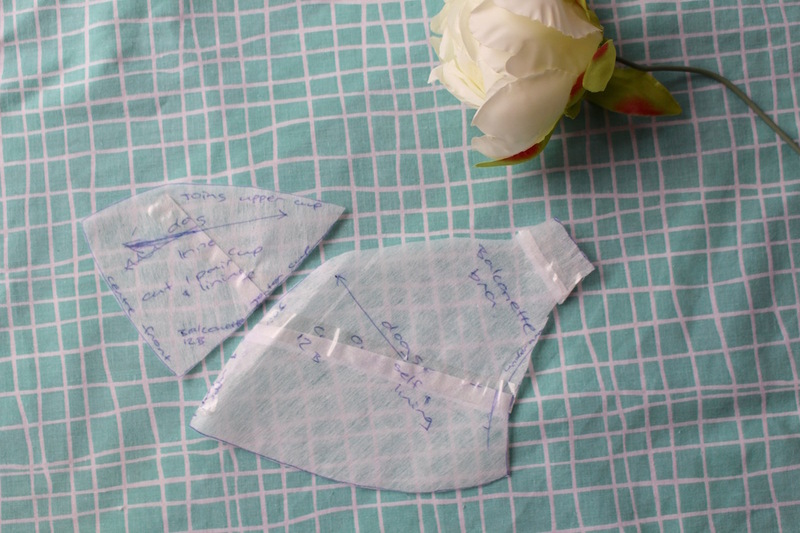 I mean, the patterns say that they’re for intermediate level bra makers (the instructions reflect this. In some parts they’re a bit sparse), so I knew I was going to be out of my depth here. Needing more guidance, I did a Craftsy course. If you don’t mind affiliate links (of which this one is), here is the bra making course I did. If you hate affiliate links, that’s ok. There’s no more in this post. You can go to Craftsy.com and look for “Sewing Bras: Construction & Fit with Beverly Johnson”. It’s a great course. You’ll see I’ve also folded out some of the top of one piece. That’s an extra tweak for my next version. The fit is now awesome and as good as a store bought one! The sense of accomplishment with this project is huge. I smile everytime I look at this bra, knowing how impossible it was to me just one month ago. I’ve learnt SO much. Best birthday present ever. This bra induced high has me wanting to make a whole lot more. Next time, I think I’ll topstitch across the panels on the cup to help them sit extra smoothly. I might also add a centimetre to the back band and lower the fabric rise where the strap elastic meets the cup. All minor tweaks on an otherwise fantastic fit. I’m so proud of this little number! A serious boost to the sewing confidence and I still can’t believe that I’ve just made a perfectly fitting bra. Don’t be disappointed if your first bra or two don’t work out. Just take it as the learning curve it is and try to reuse any underwires, channeling etc to curb the financial impact. So here’s to overcoming challenges to finding that incredible sense of achievement at the end! What has been your biggest sewing feat so far? Great review! I have found Booby Traps to be similarly very helpful. Having made a couple of different bra patterns now I am getting to know my own fitting tweaks, like yours. I love the style of this pattern. The whole bra-making thing is a bit addictive and very liberating isn’t it? It is addictive! It’s a nice change to work with lace and smaller pattern pieces. Such a great pattern and exactly what I was hoping for. We all have our fitting quirks, don’t we? I can only imagine how difficult drafting bras must be when we’re all so different! Both your bras look fab. The white one is great, looks store bought and the fact it fits on your first couple goes is amazing. I would imagine it’s quite fiddly work needing time and patience, it’s something I would like to try one day as I find it hard to find a decent fitting bra.